Great guns and iconic enemies secure Quake 2's place in the FPS pantheon. Reinstall invites you to join us in revisiting PC gaming days gone by. Today Andy finds fresh fun in the old brown corridors of Quake II. The original Quake was a muddy medieval world of knights, Lovecraftian horrors, and grim castles. But the sequel, cleverly titled Quake II, goes in a different direction entirely. You’re a space marine, naturally, who has crash-landed on an alien world called Stroggos. In a desperate attempt to prevent an invasion, Earth sent an army to the distant planet, but the Strogg knew you were coming and your arrival was a slaughter. The dropships were shot down by anti-air defences and pretty much everyone died, except you. And so, in true id Software FPS style, it becomes a solo mission. There’s a chance you don’t remember any of that. After all, Quake II is not a game renowned for its deep, complex sci-fi storyline. But the inclusion of a plot, and mission objectives, was pretty unique for an FPS in the late ’90s. As you play, a robotic voice regularly drones “computer updated” and gives you mission objectives. By modern standards that’s completely unexciting, but back then it set Quake II apart from id’s other shooters. It was more cinematic, and your actions felt somehow more meaningful. And by ‘your actions’ I mean ‘shooting’, because that’s the beating heart of the game. Shooting things, and avoiding being shot. At the time, Quake II was a technical marvel. Powered by the id Tech 2 engine, it boasted features that seem unremarkable now, but were amazing in their day. Hardware-accelerated graphics, coloured lighting, skyboxes, and the ability to return to previously completed levels were among its once groundbreaking features. 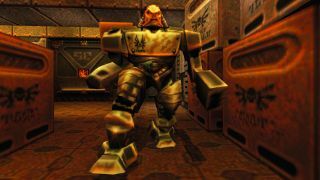 After the release of Quake II, the engine powered several other games, including, in the early stages of its development, Half-Life. Quake II also had massively improved networking, making it one of the best early examples of an online FPS. Mod support also dramatically extended its lifespan for anyone lucky enough to have an internet connection with which to download the things. People are still making mods today, in fact, including a few that let you play the game at high resolutions and with some graphical improvements. It’ll still look like a game from 1997, but it makes it a bit more tolerable to modern eyes. Character movement is mapped to the arrow keys by default, but after some rebinding you can have it playing like a modern FPS. Although, weirdly, strafing is faster than moving forward and backwards. A strange sensation that took me a while to get used to. But for such an old game, Quake II is surprisingly playable. It’s still one of the finest collections of FPS guns on PC, and every weapon you wield has a distinct personality. A big part of this is its arsenal. It’s still one of the finest collections of FPS guns on PC, and every weapon you wield has a distinct personality. The chaingun rattles at incredible speeds, getting steadily faster the longer you fire it. The super shotgun is like a handheld anti-aircraft gun, and you can almost feel the power as you unload it into an enemy and hear that echoing boom. The exaggerated kickback on the machine gun, which rises slowly as you fire, gives it a sense of physicality. And I love it when you fire the grenade launcher and hear the metal clink of the grenades as they bounce around the level. Every weapon, except maybe the blaster, is a joy to fire. But the best of the lot is the railgun. This metal tube of death fires depleted uranium slugs at extremely high velocities, which leave a blue corkscrew of smoke in their wake. The railgun is incredibly accurate—it’s like a sniper rifle without a scope—and it can cut through several Strogg at a time. In fights with multiple enemies, a useful strategy is running around until a few of them are lined up, then firing a slug. Seeing it tear through a line of bad guys is one of the greatest pleasures in first-person shooting. And the things you shoot are just as well-designed. Quake II has the standard FPS structure of starting you out against small groups of easily-killed grunts, increasing the challenge the deeper into the game you get. In the first few levels you’re fighting shotgun-toting Guards, beefy Enforcers with chainguns, and Berserkers who lunge at you with big metal spikes—and later fire rockets at you. The way enemies explode into chunks of bloody meat, or ‘gibs’ to use the parlance of the times, is still gruesomely satisfying. And there are other grisly touches, like when you don’t quite kill an enemy and they squeeze off a few extra shots before they finally collapse and die. But this is just to ease you in, and it’s not long before id starts throwing its meanest creations at you in force. The Strogg are weird cyborg hybrids, with mechanical limbs and eerily human, grimacing faces. Gladiators stomp around on metal legs, firing their own version of the railgun at you. Mutants are angry, feral beasts who pounce on you, usually from dark corners. Brains, perhaps the weirdest enemy, attack you with tentacles and blood-stained hooked hands. There’s a huge variety of things to kill, all with unique behaviours and weapons, which keeps the game interesting—especially when you’re facing several types at once. The hardest thing to stomach when revisiting Quake II is how brown it is. The switch from dark fantasy to sci-fi leaves the levels brutal, industrial, and metallic. There isn’t much variety or detail in the environments, and the colour palette is depressingly muted. The actual design of the levels is great, with plenty of secret areas and multi-level arenas to fight in, but the lack of colour and almost nonexistent world-building make it feel like a bit of a slog at times. But I remember thinking this back in 1997, and really it’s a game about combat, not drawing you into its world. And since the Strogg live only for war, I guess it makes sense that their planet would be like one giant factory. When you’ve fought your way through the Strogg and infiltrated the headquarters of their leader—a space station in an asteroid belt above the planet—it’s time to complete your final objective: kill it. The Strogg leader is called The Makron, and it’s a two-stage boss fight. Its first form is a powerful exoskeleton which comes equipped with a BFG10K, the most powerful weapon in the game. And, unlike your own BFG, it can fire it multiple times in quick succession. When you destroy the mech, it’s time to kill The Makron itself, which also has a BFG as well as a blaster and a railgun. Luckily the arena is littered with power-ups, health, and ammo, including a secret underground chamber that can be accessed by pressing a hidden switch. When the boss falls, you step into an escape pod, and that’s it. ‘The End’ unceremoniously flashes up on the screen, and your only choice is to go back to the menu. Imagine if a game ended like that today. Quake II is still a great game, and I’m surprised by how well it holds up. There’s something about the feel of the weapons, the way they’re animated and how they sound, that makes them some of the best examples in the genre. Even the new Doom, which is a fantastic ode to this era of shooter design, doesn’t have anything quite as enjoyably punchy as Quake’s railgun.